Along with many other changes, iOS 5 (s aapl) ushers in Newsstand, Apple’s centralized hub for dealing with subscription-based digital newspapers and magazines. Many existing iOS apps already support Newsstand, so you may already have noticed it at work. The first thing you’ll notice about Newsstand is that it takes your iOS subscription apps and removes their icons from your home screen — instead, Newsstand compatible apps appear as issues lined up on a shelf when you tap open the Newsstand app itself. Each issue will display the most recently released cover, so you can tell at a glance if there’s something new. Newsstand also contains a link to a dedicated digital periodicals section of the App Store, where you can browse titles and add to your subscription list. 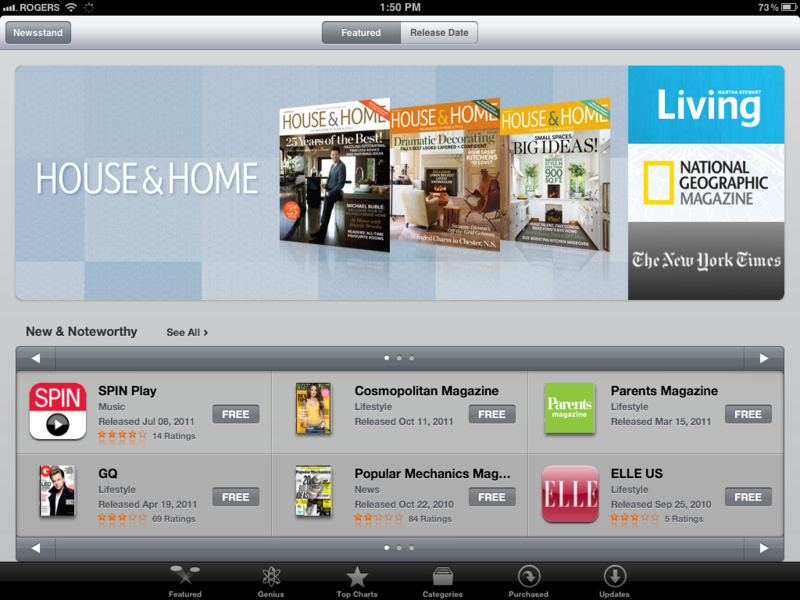 At first glance, it looks like a lot of Apple’s magazine publishing partners have signed on for Newsstand. In the Store section of your iOS device’s Settings app, there’s also a new section allowing you to choose whether or not to automatically download new content from your Newsstand subscriptions when connected via Wi-Fi. Since issues can sometimes take quite a while to download, this is a very welcome new feature. Finally, it’s worth noting that while you can’t delete the Newsstand app from your home screen, or put it into a folder, you can delete subscription apps contained within simply by holding the cover images until they wobble. Apps in the holder work the same as they did when they were located on the home screen as icons. I’m glad to have all these titles centrally located, with auto-updating content and covers, since it more accurately mimics the act of actually browsing magazines at the store. Also, I like having them all together, because that’s how I tend to digest my periodicals anyway: all at once in long sessions. Do you like Newsstand, or did you prefer things the way they were? I have several magazine on Zino. How do I get them to Newsstand? My Phone, My Choice. I would like to be able to put the NY Times where I want to put it. Not in the Newsstand. I do not like Newsstand. I prefer the apps as they were; I can put them where I want them. And now it takes two steps to get to each app. Before I could just touch the NYTImes app, now I have to go into Newsstand to access it. Don’t like it. One more folder I have to open to get to my most used apps. Inflexible. Okay everyone, you CAN put the newsstand app in a folder. Here is how: grab one app and drag into another- as soon as the anamation begins to create a folder, quickly grab the newsstand app and drag it in as well. You have to be fast, but if you are quick enough, the newsstand app will go into the newly created folder. Now hurry and do it before apple fixes this glitch ! Hate it & why on earth does it take my freebie nytimes app & now want to auto bill my itunes account! Sorry u cant just dip into my bank account as u wish – no way! V annoyed about this not to mention rhe fact that the mags all seem to say free on install yet they too will want to auto dip into my itines billing! How very dare u! Get rid of this garbage n let those who may even want it opt in instead of forcing ios 5 users to theft from unknowing users or have the icon even if not wanted! Well, has anybody else figured it out yet…? The reason you can’t put it in a folder (apart from any deals that Apple may have done with their publishing partners, so they don’t think their publication would be hidden from view) is that the Newstand app isn’t much of an app at all – it is itself essentically already a folder. Click it and watch how it opens up, just like the other folders. iOS 5 Jailbreak anyone? i want to delete it! Are there really only 12 magazines? Really don’t like the news stand. For those who do not have subscriptions it is just in the way taking up space and looks tacky. Understandable if you have subscriptions, but it should have setting as to whether you display it hide the newsstand. It’s a pain that you can’t move it to a folder… What was the logic behind that? Why you can’t hide it in a folder I’d beyond me. I’m not worried though, not being able to put it in a folder is obviously idiotic so I assume it is an unintentional bug and will probably be one of the first delta updates we get. I’ll wait until apple proves me wrong to start losing faith in them. Developers do tend to be on denial over user demands (I still don’t use tabs on top Mozilla and the day you take away that option is the day I switch to chrome!). just plain STUPID!!!! like steves vision of a power button… LAME, pointless, retarted and idiotic! really you want to make an electronic device(thunderbolt monitor) with NO power button! its mean but im happy hes not in charge anymore. 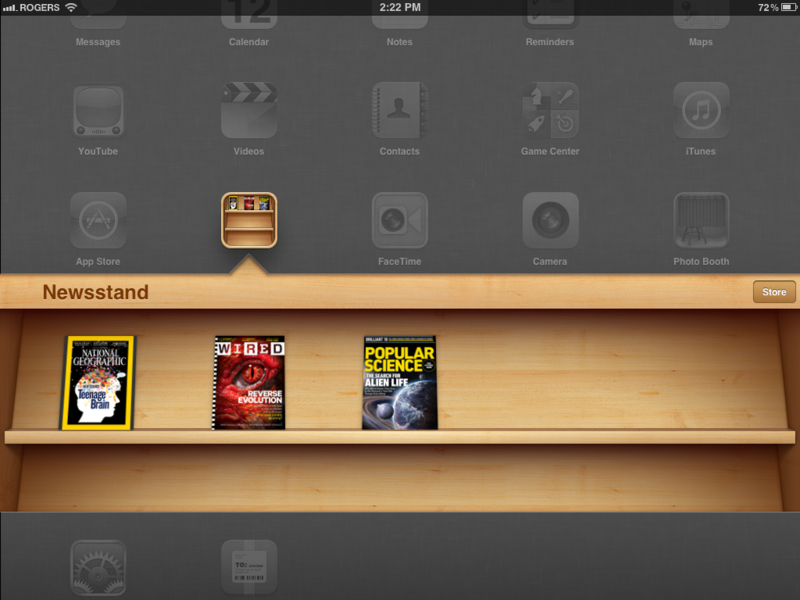 Newsstand sure looks nice like iBooks but I use Amazon and Zinio (for magazines) because of content. Both Amazon and Zinio let you also read your media from a browser on a PC and on any device. Not cool at all! You should be able to delete it or throw it in a folder! This is a stupid addition. There are at least two dozen decent apps in the app store that do this same task without taking up the space of a folder. Like the Stocks app, this is something that does NOT need to be a standard app. All it does is clutter up space on my iPhone and iPad. For those people who don’t read eight thousand magazines, it’s a waste of time, space, and aesthetics. Frankly, it’s just annoying. It’s bad enough I can’t remove other Apple apps from my device (it’s not as if I am deleting them for good, just getting them off my iPad). It’s very annoying – especially for OCD me – that I can’t at least up it in a folder: the one I already have called “Apple Crap.” Better yet, just let me disable/hide Apple apps from the settings menu. Please! Hmm, let me check out Newsstand. Let’s see . . . push “Store”. Cool, NYTImes . . . free . . . is that possible? Maybe it’s for a month of two? OK, I pushed the NYTImes Icon, and it says “free” again! Push “free”, “install”, and put my Apple ID in and push OK. What’s this, “Verification Required . . . verify your payment info. But it’s free . . . maybe they need ID or something. Push “Continue”. Apple ID again and OK . . . jezzzus! It says: “Your address does not seem to be a regular US address” . . . and my credit card info . . . what is this??? I better go back. Press “Cancel”. Ohhh . . . subscription for $14.95/month . . . why don’t they just say this up front!!! I might get MacWorld or something, but now I don’t trust it . . . too sneaky . . . and involved. Can’t find MacWorld anyway. Boy, it would be nice if they didn’t have “free” written all over this app and had a little explanation about subscribing. I’d certainly feel better about it. I agree. I was misled into thinking the apps were free. However, a magazine for free! Sounded too good to be true. It is. Although I never downloaded anything, I read the app information numerous times. There certainly is no mention that by downloading the free magazine, your are entering into a subscription. Thanks for your post, probably saved me a few pennies! Lion and iOS5 is veeeeeeery Microsoft, forcing you to use their software and not allowing you to delete it. Are you freaking kidding me? I love both companies, I use PC Desktops for the flexibility and Apple mobile devices for the excellent design. That being said, Apple is the KING of forcing you to use THEIR stuff. Their own OS is HARDWARE LOCKED so you have to buy their stuff to run it on, UNLIKE windows which runs freely and just about anything that can handle it. Forcing you to use their stuff and not allowing you to delete it is Apple’s standard business model. The Internet Explorer 6 fiasco is what you’re talking about and while it was sort of shady, you could always hide the icon and use a different browser; you couldn’t delete it because it was integrated into their Explorer application which was not entirely unreasonable. MS does its share of shady business but give credit where credit is due; Apple perfected the model of limiting non-advanced users’ capabilities. My only gipe is the lack of content for the international market, specifically UK & Europe. I was particularly excited about The Daily during Steves keynote earlier in the year only to find out on the date of release it will be US only. Would be nice for Apple to sometimes specify regional availability upfront but its only a small thing. The truth is if you travel as much as i do i want the option to purchase content from any location where licensing allows. And if it doesn’t, tell me that and i can stop blaming Apple each time. I really hate that Apple doesn’t allow this to be put in a folder. I have a folder called “useless crap” for all the Apple stuff that I never use but can’t delete. They just can’t leave well enough alone. I can understand a reaction either way on the “enforced” placement issue. Oops, did I just reveal my bias? I prefer to have the NY Times app, for example, available as a standalone so that I can get to it with a single click, which I do several times a day. Now, I have to click on Newsstand, find it, perhaps with some scrolling of the cute carousel, and then click again. A waste of time. More to the point, this is outrageously obtrusive, whether by Apple’s we-know-best-and-you-don’t or Microsoft’s totally-clueless-about-how-real-people-work strategy, I wouldn’t want to guess. So obtrusive, in fact, that I may well cancel my NYT subscription, and I will certainly not purchase any others. BTW, ask yourself where this could lead for the longer run…. How about *all* of your apps in a single large… oh, wait, we already have that. It’s called the iPad! NYT put themselves in Newstand. Now maybe Apple asked if they would like to be a featured/flagship offering for Newstand, but I strongly doubt apple forced this on them. Is there a way to remove the NYT app from Newsstand? i really don’t like newsstand. i can see why it’s beneficial, but i don’t have any subscription apps where i even use it. it would be nice to be able to at least put it into a folder so it’s not sitting, empty and ugly on my home screen, since i know i will never use it. I don’t like that you can’t put other news apps in it, like USA Today or the Engadget app. I’d like to have all my news stuff, subscription or not, all in one folder. I’m fine with putting everything in Newsstand, but I can’t do that nor can I put Newsstand in a folder, so right now, I have to have a News folder for all my news apps and Newsstand right next to it since NYTimes and Popular Science are forced to go in there. I know exactly wht you mean, I tried to transfer all my newspaper apps into newstant and it just kept moving away, annoying and it just doesn’t make sense not to have all the news stuff together. Right, it has to be open for all News Apps. A censorship here is hilarious. This reminds me of the old Internet Explorer BS from Gates. I don’t want it but I have it weather I like it or not BS. Is Apple trying to push us to Android? you would really move devices and OS platforms over something like this? Come on people all we have to do is ask in big numbers and Apple will hear us. Yes I would change devices or at least jailbreak to remove it. I agree, making a huge statement of moving to Android over this is a bit much. I don’t think this is exaggerated at all. I really hate it. I like having choices. I like keeping my stuff organised. I keep all my reading applications in one folder, and that is where newsstand belongs, and I can’t move it. I will have to create a separate page five pages away so that I would never see it again. But then, I hate having too many pages. I find it vexing, to force an app to stare in my face when I don’t want it. Yer of course this is a reason to move systems and devices. We are constantly bombarded with cheaper and more flexible systems. Why would you want to stay with a system that is proscriptive and dictatorial? i would just like to have the ability to hide it in a folder since i dont use it. All newsstand apps are listed as “free” when you download one are you charged anyways for the single issue or are you not charged until later? I can go either way on it; what I really *don’t* like is that you can’t put it in a folder. I may use it on my iPad, but I never read any magazines on my iPhone, so NewsStand is, literally, just taking up space. And since I can’t put it in a folder–I have a special folder for Apple stuff that can’t be deleted from the iPhone but that I never use, like the Stocks app–it takes up a *lot* of space. And that’s just not okay, in my opinion. I also dislike the inability to be able to put the newsstand app into a folder. It’s new, compared to the other old useless apps you would normally just hide in a folder like Stocks etc. This workaround is NOT permanent; the next time you sync, you’ll find it outside the folder! And, if you have any subscriptions already in the newsstand folder and try to open them, you’ll crash your iPhone/iPad.